Anyone who knows me has probably wished I would shut up a bit about my retired racing greyhound, Titus. 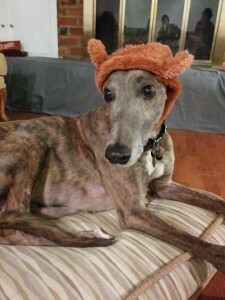 My husband and I adopted him in 2010 through Greyhound Crossroads, a local adoption and support group that serves the Carolinas and Georgia. Titus is a sweet, earnest weirdo. He’s 85ish pounds of skinny, alien-looking lizard horse. He has a beautiful blue brindle coat and he chatters his teeth when he’s happy. He likes crinkly things and has a bad habit of stealing disposable silverware packets and hoarding them on his bed. And he has the most soulful, heart-stealing expressions. I just love him. We’ve come to learn more about greyhounds in general through our association with Greyhound Crossroads and other greyhound owners in the area. And it’s made me realize that this singular dog breed has a lot to teach us about talent and success, especially when it comes to performance and identity as a company. Know what you’re good at, and strive to be REALLY good at it. Greyhounds are FAST. Their top clocked speed is 39 mph, and it’s really amazing to see one take off at a full sprint. Their muscular, lean bodies are built for speed, and their two-phase gait (called a double suspension gallop) is different from that of many other dogs and results in the iconic “flying” position depicted in the Greyhound bus logo. While this gait helps give greyhounds their signature speed, it sacrifices endurance. A greyhound (most of them, anyway) can’t run a marathon with you. Plus, greyhounds are a very quiet breed and generally not territorial, meaning they’re terrible watchdogs. We’ve had Titus for almost five years, and I’ve only heard him bark six or seven times. Simply put, greyhounds are fantastic runners, and, with a few exceptions, they love to run. It’s what they’re known for, and what they excel at. However, if a greyhound “decided” to pull a heavy sled in cold temperatures like a husky, or attempted to be a full-time purse dog (that would be an enormous purse), they would not only fall well below the competition, but they’d probably also lose some ground in their running. What this means for companies is simple: Don’t lose sight of what you’re really good at, and put most of your effort into that. I’m not saying to never branch out and try new things. But if you’re a social media management company, and you put too much of your valuable time and resources into, say, web development without the talent or know-how…. Well. You’re gonna have a bad time. Agility is just as important as speed. I recently read this article from the Content Marketing Institute about how successful storytelling (and marketing in general) is “quick, not fast.” What they mean is that you should utilize your time in the smartest way, and remain agile so that you can quickly evolve with the industry. Titus loves to run around in our fenced-in backyard. He zooms around the garden, trees and bird feeder in a figure eight pattern at breakneck speed. And that adjective, “breakneck,” is exactly what could happen if he wasn’t agile and aware of his surroundings. Unfortunately, greyhounds have been seriously injured or killed from running into things. They’re so fast that the force of impact can be fatal. But Titus IS remarkably agile, even when I feel sure that he’s going to crash into the fence or plow into a tree. When my two-year-old nephew visits, he loves to watch Titus run and I’m always a little concerned that he might knock the kid over. But at the last second, Titus turns on a dime and dodges him, to my nephew’s delight. That kind of maneuver requires skill, of course, but it also requires being able to closely read your environment. Say you’ve embarked on a particular marketing campaign. You have all your collateral written, designed and almost ready to go. Then BOOM… you’re browsing Facebook and see that your main competitor has launched a markedly similar campaign. What do you do? Or say Google launches a new platform, and it offers a great opportunity for your company to promote themselves. It takes agility and initiative to pluck up some of your resources from other areas and devote them to something new, but that’s how people stay on the forefront of marketing trends and exposure. Speed is great, but without agility, you’re setting yourself up to plow into a fence. People are going to have misconceptions about you. Prove them wrong. 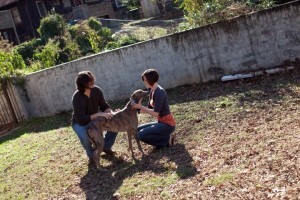 When we first got Titus, I was amazed to find out how many misconceptions there are about greyhounds. The one I hear most is “Oh I’d love a greyhound, but I hear they’re really high energy.” FALSE, and excuse me while I laugh heartily, because Titus is one of the laziest creatures I have ever encountered. That dog sleeps at least 17 hours a day, and when he’s not sleeping, he might as well be. Yes, he likes to run, but it usually involves him sprinting around the yard for a maximum of five minutes. Then he’s back to his bed and probably won’t even move for several hours. Now don’t get me wrong… I think breed discrimination is misguided and I know most Dobies, Pits and Rotties are sweet as could be. 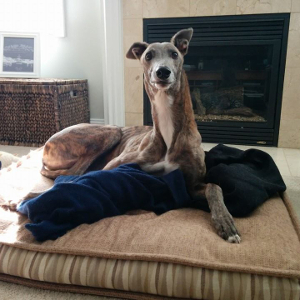 But when it comes to gentleness, greyhounds are in a totally separate league. They’re sensitive, quiet, earnest souls without a vicious bone in their bodies. 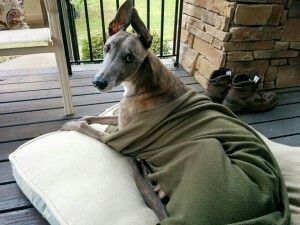 Now that more people are actually adopting greyhounds, however, this unfortunate myth seems to be dissolving. It’s important to face these misconceptions head on, without defensiveness, and to address them when you think about your sales and marketing material. Accept that some people may come to you with uninformed, preconceived notions about what your company can and can’t do. The best way to dispel these misconceptions is to demonstrate, with transparency and integrity, that they simply don’t apply. Anyway, TL;DR, greyhounds are exceptional creatures and gentle, loving pets. And at the risk of being sappy, I really do believe they have a great deal to teach us about performance and identity, both in the workplace and in life. Enjoyed this post? Read more from Sally.